We love when a traditional favorite exhibits such an unusual twist! Such is the case with Forever Susan. 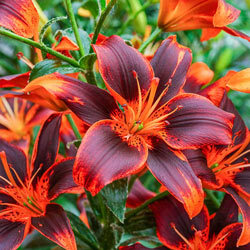 This Asiatic variety features the easily recognizable lily form with its chic, upward-facing habit and supple, broad petals at tall, straight stamens. But this pretty newcomer bestows a brand-new color palette upon the landscape with orange petals that blend to deep purple and are generously tipped in yellow. It adds long-lasting zing to sun-filled borders, along walkways and in cutting gardens. It's the perfect bloom to add to mixed arrangements, and just a few stems can be gathered to create a lush single-variety bouquet. Forever Susan is a great perennializer, returning yearly with even greater vigor. Butterflies love the open, fragrant blooms, too.